Do You Listen to Music to Cope With Your Commute? Everyday after work - before I even open the office door to leave - I make sure my earbuds are in and my song is selected so I can press "play" as soon as the door swings open and I step foot onto the busy London pavement. Abnormal? Dangerous, even? Perhaps, but listening to music is the primary way I cope with stressful city living. I couldn't imagine getting from point A to point B without a song to accompany my stride. Once, I left my headphones at home and was so anxious about the possibility of having to take the tube from Oxford Circus tube station (arguably one of the busiest tube stations in London during rush hour) to a dinner, that I actually had a panic attack and ended up walking/taking the bus to my destination - tacking on an extra 40 minutes to the commute. Big city living is anxiety provoking: living in London is often like running on a hamster wheel non-stop. If you do stop, the wheel will just take you with it, much like these poor guys (I make it sound so appealing, don't I?). "I don't think I like London very much," confessed Debbie, a friend of my parents who was visiting England for the first time. "I mean, I loved York, I loved the Cotswolds, but London is just ... so busy. Plus, people walk at you from all different directions! I find it very stressful." As someone who suffered from anxiety attacks throughout childhood (I was even checked for stomach ulcers around the age of 8 or 9), it's no surprise that I agreed with her sentiment. The difference is, I like living in such a big city - I just find ways to cope with the stress. "I don't know how you do it," my friend Alice said as we walked home together one evening (this is after I ran breathlessly up to her from behind and tapped her on the shoulder saying, "OMG. I'm so glad I found you. I left my headphones at home." before realizing how incredibly rude that sounded - haha!). "It would freak me out not to hear all the road noises or the birds chirping in the morning." And I totally get where she's coming from. If I lived in the countryside - like, from John's village in Leicestershire, for example - I'd never wear my earphones. I'd luxuriate in the clip-clop of horses hooves on the country roads or the gentle purr of a tractor making its way to a field. Heck, I might even learn to distinguish one bird call from another. But the fact is that I live in a frantic, frenetic, pulsing, intense city - not the calm, slow-paced confines of the countryside. Music makes it all okay: the people too busy checking their phone to walk straight at me, the group of builders cat-calling me from across the road, the loud argument that's taking place on the corner between a man and his partner, the skin-crawling sound of a motorcycle engine being revved only a few feet away, the constant, angry honking of car horns on High Holborn, the aggressive dogs barking at the end of scary-looking chains held by scary-looking owners ... all of this disappears when I've got my music in. I walk more confidently. A lot calmer. I'm able to react to situations with reason and sense (up to a certain extent - ha!) rather than anxiety and emotion. Of course, I recognize the dangers of walking around with my headphones in. I try not to listen to my music at too high of a volume (though the point is sort of to drown out my surroundings) and I won't cross the street without waiting for the little green man to appear and looking both ways. But I simply wouldn't know how to cope without my premium Spotify account or my trusty in-ear Sennheisers. p.s. 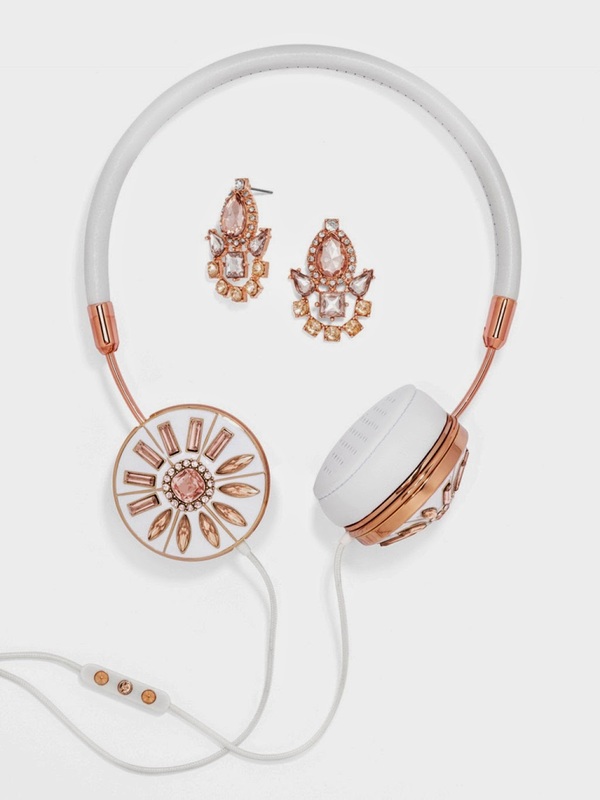 I covet this pair of BB x Frends headphones from Bauble Bar. Right there with you- I use the bus to reach my office, and I need music in my commute to tune out the other crazed people. Having music to travel with is a necessity. Glad to know I'm not alone, Steven! It helps me focus as well - I can think through solutions to problems or come up with ideas (like blog posts!) when I'm listening to music on my commute. My answer is yes! It is one of my favorite hobbies. Nice!